The S&P 500 Low Volatility Index measures the performance of the 100 least volatile stocks in the S&P 500. In its latest quarterly rebalance (effective at the market close on February 17, 2017), the index scaled back weightings in Utilities, Health Care and Real Estate while adding weight from the Technology, Financials and Consumer Discretionary sectors. The 7% weight in Technology is still relatively small compared to, say, Utilities, Consumer Staples or Industrials, but it is amongst the highest ever for this sector in the history of our Low Volatility index. 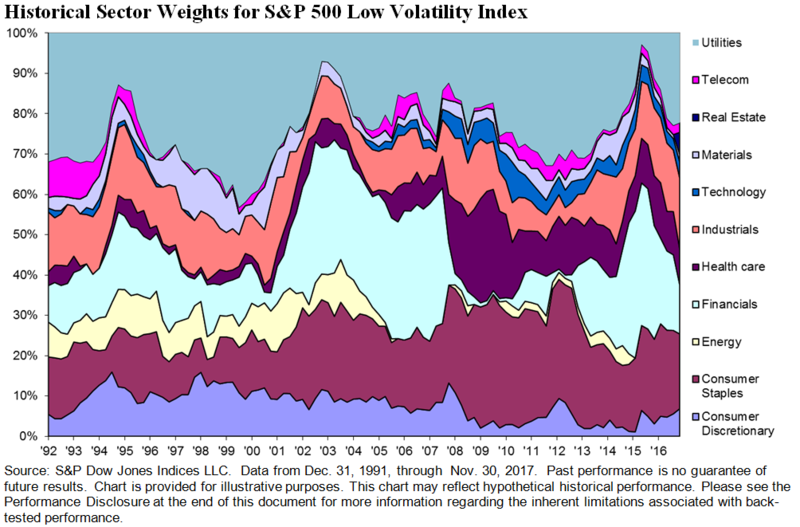 Typically Low Volatility holds little to no weight in Technology (see chart below). Amongst the additions as of the latest rebalance are, notably, Alphabet and Oracle. So have technology stocks become significantly more stable recently? Though the index methodology measures volatility at the stock level, the recent behavior of S&P 500 sectors provides some context. Remarkably, the rolling 1-year volatility for all 11 sectors has declined compared to three months prior. 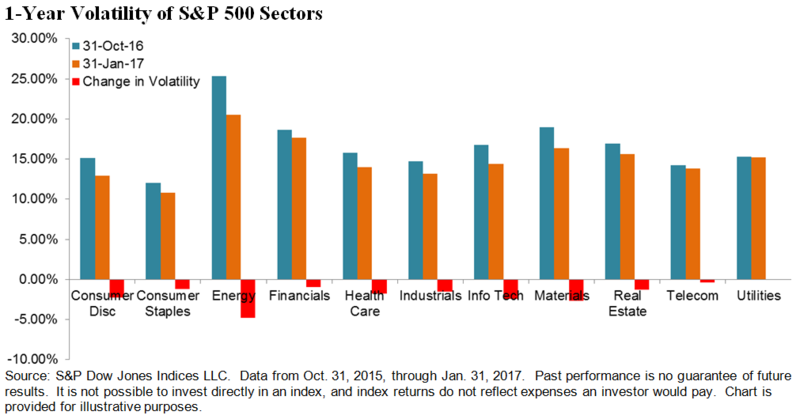 The sectors that had the highest reduction in volatility were Energy, Materials and Technology. Looking at volatility at the sectoral level isn’t the same as looking at volatility at the stock level. But using this rough gauge, it seems the reduction in the weighting of sectors like Utilities came about not because their volatility increased, but because the volatility of other sectors like Technology declined more.